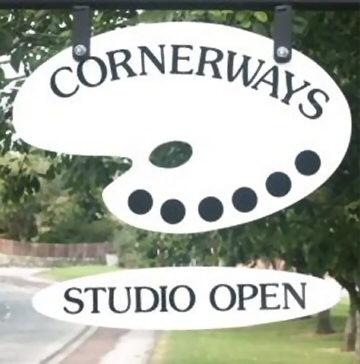 Welcome to Cornerways Art Studio. As well as being my home, my house is also my studio and small gallery where I welcome customers old and new to come and visit me every Friday. 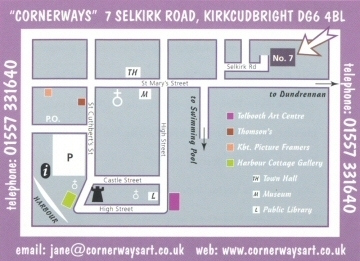 My home/studio is located in the small harbour town of Kirkcudbright on the shores of the River Dee. On display I have a limited number of works which can be purchased and taken away, and a selection of Miniature paintings including pendants, paperweights and other small items to choose from. You can view a selection of my work in my online gallery. Some of these are for sale. Contact me for more details. International shipping is available. This area of outstanding beauty, with its great qualities of light, brought artists’ in the 1880’s to paint in this quiet corner of south west Scotland and establish Kirkcudbright as an Artists’ colony. Some well-known names in art deciding not just to visit the town, but to stay in Kirkcudbright for the rest of their lives. Today, Kirkcudbright is appropriately called ’ Artists’ Town’.